What were the designers thinking? There is no contrast on the “Related Space Links” on the Discovery Channel special, “When We Left Earth” which, of course, makes them useless. This screen capture is with Safari/Mac but the screen looks the same with Chrome and Firefox. If you are space junkie, here are the links in a readable form! Discovery SPACE: featuring the “Space Blog Squad”, video, news and more! NASA 50th Anniversary: celebrating 50 years of innovation, inspiration and discovery. 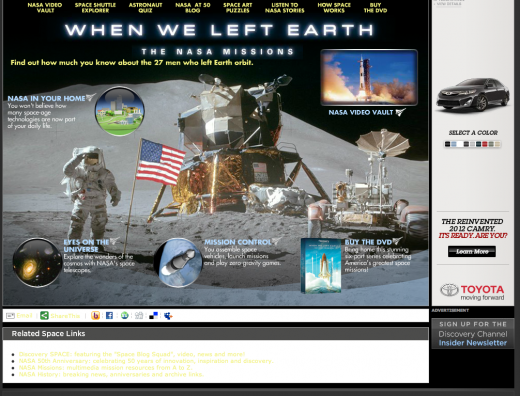 NASA Missions: multimedia mission resources from A to Z.
NASA History: breaking news, anniversaries and archive links.